We love the spring season, when Novruz decorations, colorfully wrapped presents and flavor of sweets overtake downtowns around the country. It’s the time for a Novruz getaway, or maybe visiting relatives, preparing for baking sweets, and, of course, joining local festivities. 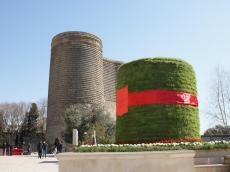 Traditionally Novruz is marked in Azerbaijan with an annual festival set up near the Gosha Gala Gates in Icherisheher for several days. Here, Baku residents and guests enjoy many interesting events, including the performance of wrestlers - Pehlevans , rope-walkers and magicians, as well as artists of the children's theater. This year’s festival entitled ‘Spring Fortress’ will run from March 19 till March 26 and be a festival of friendship and traditions. The festival will feature friendship among the peoples during Novruz: Iran, Turkey, Kazakhstan, Russia, India, Afghanistan, Uzbekistan, Georgia and Tajikistan will show how they are celebrating Novruz in their homeland. Guests will enjoy quizzes, performances of stars, animation program for children and much more. A series of events, including workshop on baking tandir (bread), cutbow tasting, unique tours with retro cars and much more will be held in Gala Reserve. You can reach the reserve for free on March 20-21. The bus will depart from Gosha Gala each hour. Novruz is celebrated each year on March 21, when the sun enters the sign of Aries on the astrological calendar. In the northern hemisphere, this date frequently coincides with the spring equinox, the day on which the number of daylight hours equals the number of nighttime hours. On our modern Gregorian calendar, the spring equinox varies from March 19 to March 21. Before the actual holiday, people mark four pre-holiday Tuesdays, each of which is dedicated to the awakening of one of the natural elements called Su Chershenbesi (Water Tuesday), Od Chershenbesi (Fire Tuesday) Hava Chershenbesi (Wind Tuesday) and Torpaq Chershenbesi (Earth or Last Tuesday). People do house cleaning, plant trees, paint eggs, make national pastries such as shekerbura, pakhlava, shorgoghal and a great variety of national cuisine. Children jump over bonfires and run through the streets and knock on doors to ask for treats.